Presbyopia compensation with multifocal contact lenses (CL) has proven to be a challenge due to the difficulty in producing complex optical designs capable of increasing the depth-of-field of the eye to provide the user with clear vision over a wide range of target vergences. The major disadvantage of simultaneous-imaging devices, such as bifocal or multifocal contact lenses, is the physical limit imposed on the final retinal image quality. The extended depth-of-field of the eye is achieved at the expense of the total light entering the pupil being redistributed with varying focal lengths. This implies that at any given focal plane, the light rays refracted to other foci will decrease image modulation, resulting in contrast attenuation. Although high-contrast acuity is relatively robust against contrast loss, there is great inter-individual variability regarding the degree of patient satisfaction with simultaneous-imaging CLs, i.e., some patients are satisfied with the quality of their vision, while others are not. This inter-individual variability may be related to optical and physiologic factors that limit the predictability of the visual outcomes. Multifocal performance is related directly to the area of the pupil exposed to the CL optical zone, which directly affects the balance of light distribution between distance and near foci. In addition, the eyes’ inherent spherical aberration (SA) affects light modulation from the outer pupillary regions due to the coupling effects of the eye and CL aberrations. Figure 1. 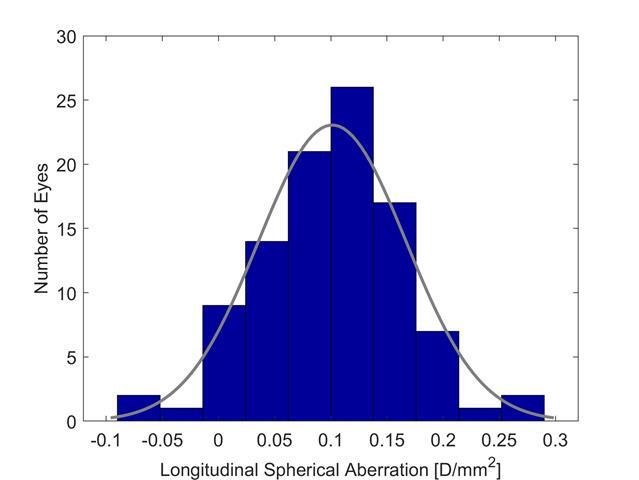 Normal distribution of fourth-order longitudinal spherical aberration of the mid-presbyopic eye (mean ± standard deviation, +0.10 D/mm2 ± 0.07 D/mm2). For these reasons, pupil diameter and SA are the two most important factors affecting image quality through simultaneous-imaging soft CLs. Even without undesired SA coupling effects, light refracted from the outer parts of the pupil also tends to be less effective than light refracted through the central zone due to aperture diffractive effects and pupil apodization. Thus, the power distribution in the optical zone of the CL should be calculated to balance near and distance image quality while accounting for these effects and should not rely simply on equal area distribution between the distance and near optical zones. Figure 2. Effects aberration coupling between a multifocal four-zone centre-near design and an eye with zero and +0.10 D/mm2 of longitudinal spherical aberration. In a recently published work in Ophthalmic & Physiological Optics (January 2019), we used optical modelling to explore the visual performance of a population of one hundred synthetic eyes fitted with four different centre-near and centre-distance bifocal/multifocal designs. The CL power profiles were calculated to balance the SA of an average eye and were designed having zone diameters optimized for the range of pupil diameters of a normal presbyopic population. In addition, the current study also explored whether improved image quality could be achieved by customising the bifocal/multifocal lens power profiles for these eyes. Among other findings, the study concludes that eyes with SA levels that deviate significantly from the average will underperform when fitted with simultaneous-imaging CLs that have power profiles calculated for average eyes. It also states that the success rate of multifocal contact lens fitting might be increased by introducing power profiles calculated for eyes that have SA levels significantly different from the average of the population. Thus, some degree of customisation of the CL power profile regarding the eyes’ inherent SA might maintain the desired balance between the distance and near image quality over a range of physiologic pupil diameters. Miguel Faria Ribeiro, MSc Optom, PhD, is a clinical optometrist and vision scientist currently working as a R&D Scientist for intraocular implants in Johnson & Johnson Vision, Groningen, Netherlands and is an external collaborator in the Clinical and Experimental Optometry Research Lab in University of Minho, Braga, Portugal. 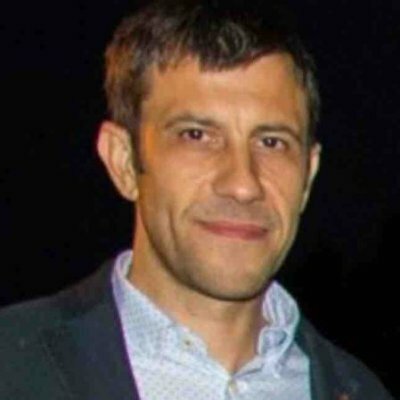 He has published several papers related to contact lenses, visual optics and modelling of optical solutions for myopia progression and presbyopia.